Meat Loaf fans have gone wild over Jim Steinman’s new show returning to the West End, but does Bat Out of Hell really cut it as a musical? This well-executed, spectacular, random mess of a show might have some way to go before appealing to a wider audience but is still worth a watch. Check out my blog about the exclusive Bat Out of Hell launch event! The story is your classic Peter Pan and Wendy/Romeo and Juliet tale set in the post-apocalyptic toxic land of Obsidian, ruled over by the tyrant Falco. He desperately attempts to keep his innocent daughter (Raven) away from The Lost, a group of children who will never age past 18, who wage a war against Falco. Raven falls for the leader of the tribe, Strat, and, encouraged by her mother, runs away to be with him. There is a clear, conflicting feeling about this show – it is a breath of fresh air yet at the same time completely misguided. The special effects and staging push the boundaries compared to other musicals on the West End right now. The set is great and the vocals are outstandingly tight, yet there’s something that just doesn’t work about it in a musical format. Meat Loaf is known for dramatic songs – perfect for theatre you may think. However they feel shoehorned in with this plot and are far too long, with it seems no attempt made to cut down for theatrical effect. Only a handful of songs actually help to move the plot along and I found myself watching and hearing incredible things but feeling almost bored. It is sad that the make up of the show is so busy it makes anything good seem almost wasteful, but at the same time it is strangely intriguing, and there certainly is a lot of ‘good’ wedged in amongst the random. Personal highlights include the act one finale, where a motorbike breaks up in the air to form a heart, and It’s All Coming Back To Me – a masterclass in vocal performance and one of the only numbers to win me over by its pure simplicity. Some of the other numbers could have done with the same treatment – many throw too many effects and noise at the audience without the need for them. Andrew Polec is scarily enchanting in the role of Strat and a powerful leading talent. Christina Bennington makes playing his love interest, Raven, seem effortless with a gorgeous powerful voice that does Meat Loaf’s songs true justice. It is difficult to highlight every lead in this show when they all sing so brilliantly, but I was wowed by the smooth tones of Danielle Steers (Zahara) and strong vocal presence of Rob Fowler (Falco). I applaud the team for their boldness in making this show, and the cast for wowing audiences by reinventing the music for the stage. Just be prepared for a strange theatrical experience which you may simply love or loathe. I tend to judge shows on three main elements – plot, music and presentation. Well… two out of three ain’t bad! 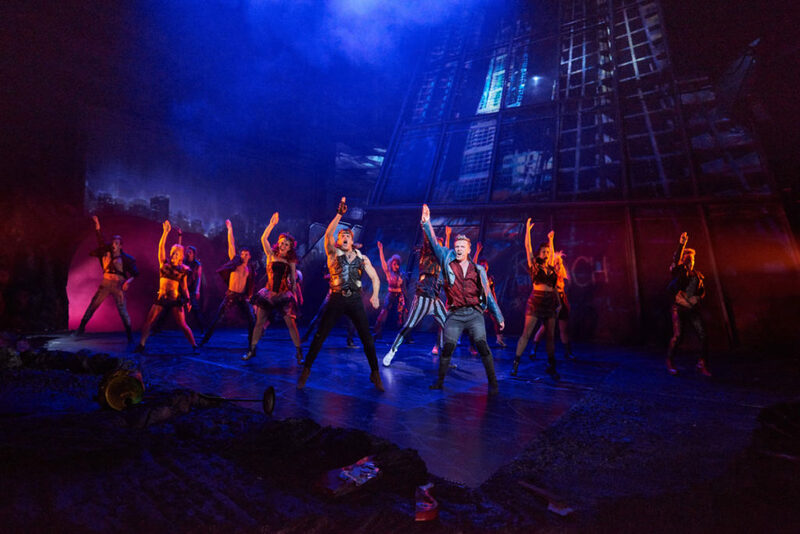 Bat Out of Hell is playing at The Dominion Theatre in London’s West End, currently booking until 27 October. Tickets available online here or get daily rush tickets via the Today Tix app for just £25.